I guess it’s no secret that I’m really not much of a farmhouse kind of gal. I mean, I do LOVE farmhouse decor, but other than a few touches of the farmhouse look here and there, my house is pretty much a traditional on its way to super casual. With this, WHY on earth would I be going all farmhouse when it comes to gift wrapping? Well, this week, I saw a Christmas tree decorated by Joanna Gaines. It was, as you can imagine, the usual brand of Joanna Gaines perfection. But it was more than just perfect. It was soft and gentle, and totally neutral. But even with all of the neutrals, the tree and the packages under it had such a powerful presence. And so I decided to dissect the Joanna brand of gift wrapping magic and recreate some of that “presence” in my own home. First, all of the packages were wrapped in brown paper. Yes —every single one. She did not mix in companion papers. It was all paper bag brown. To create this look, I got a roll of this paper from HomeGoods and from the Dollar Tree, but for heavier and/or oversized packages, I used the thick brown paper found in the paint section of the home improvement store. It measures 35-inches wide with unlimited length and is tough as nails. And, from what I could tell, Joanna mainly used brown twine with a hint of red on all of her packages. She may have had some ribbon on packages underneath or in the back, but there wasn’t any that I could appreciate in the photo. It looked like all of the packages were wrapped exactly the same –in brown paper with the same colored twine and name tags. The only thing that was different was the size of the box. But, honestly, as lovely as that is, I really didn’t want to just use brown-on-brown or light-red-on-brown under my tree. So I respectfully opted to put a simple twist on Joanna’s beautiful idea and make it my own. To make this happen, I gathered stiff, two-sided, red and black plaid ribbons, different twines, and solid-colored textural ribbons that co-ordinate with each other. And I love that the red and black plaid also works with black chalkboard name tags. Actually, I’m not sure if I will end up using the buffalo checked paper under the tree, but since I wanted a cohesive look with lots of red, I wanted it at the ready —just in case. My hat tip to Joanna’s packages begins by slipping a simple plaid ribbon between the twine and paper. And if a long piece of twine is used, it can be threaded through the name tag, wrapped around the box, and then taped together on the backside. By doing this, it gives the illusion of being tied around the box —just like Joanna would do. For a visual change, a wide ribbon that looks like a loosely woven burlap provides texture and color in one. And it looks great stretched across the paper, don’t ya think? The only problem is that it’s not very stiff, so it’s best to confine this ribbon to smaller bows. And then added another textural ribbon between the burlap ribbon and plaid ribbon on the next. The key, I think, to capturing Joanna’s look-with-a-twist is really pretty simple. It seems to take on a life of its own when packages are wrapped in brown paper and then made unique by adding a different combination of coordinating ribbons. I’ll add the link to her Facebook photo below, but what she said was that she planned to give the gift of herself to all of her loved ones and home decor fans. She planned to put away the phone and minimize other distractions so she could look people in the eye, smile at them, and love them in an old-fashioned way. And just like that, Joanna had, once again, found the secret. So here’s to tackling December ~~and Christmas ~~the Joanna Gaines way. More presence and less presents. Because it truly is a “present” to take the time to love others in that old-fashioned, Joanna Gaines kind of way. For Joanna’s Facebook photo and comment click here. As for the red and buffalo checked paper. Remember that? Well, it ended up —along with some of Joanna’s twine– in an entirely different post. You can click here to see the Cozy Christmas Out By the Fire post on this blog. 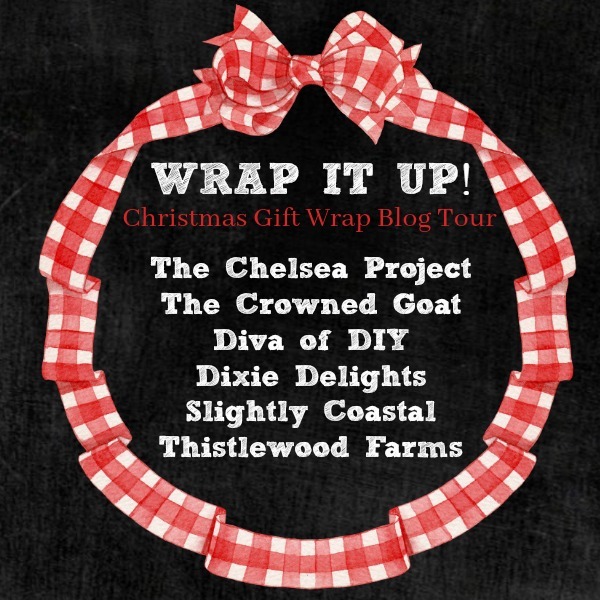 But for now, let’s check out more fun and festive wraps from my uber-talented bloggy friends..
Special thanks to Nancy from Slightly Coastal for organizing this hop! I love plaid too! I adore gift wrapping. Love the brown craft paper with the pops of red! Thanks for the reminder on having a presence with my family, more than just giving them presents. A lesson well spoken. I hope you have a fantastic weekend Susie! It was so great to hop with you. Wow….just wow! You TOTALLY delivered! I love all your ideas and it’s perfect timing because I have so much wrapping ahead of me. I love the tips and tricks esp the layering of elements. I’ll have to try a few of these this year for sure. They all look stunning Susie. Terrific job! Thanks Carolann! Always love having you stop by! Happy Holidays! Good job, I love them, and i love gift wrapping or I should say designing the wrap? Homegoods and Marshalls are my favorite place to get gift wrap and ribbon. You did a beautiful job. The packages look just right. That all looks so lovely, I love the brown paper with the pops of color and the different ribbons. I especially love the chalk board gift tags. Thanks Toni! I do, too. I would never have guessed that brown paper was my fav for this season, but here we are. Thanks for stopping by. Happy Holidays! Great lessons, Susie! And your wrapping… Fabulous! I’ve been wrapping my presents with brown and plain white paper and I love how the ribbons and accents take them to the next level. I love the plaid and burlap ribbons you used. I was glued to every photo and sentence. I adore your packages. They are perfect. I did a theme last year of silver and gold last year and know how it makes all the difference in presentation. I will always remember your wrappings and you hacked Joanna Gaines to perfection. Thanks Sue! Love having you stop by! Merry Christmas! I just love the plaid, red ribbons. It’s so festive and looks amazing. Hey Vanessa and thanks so much!